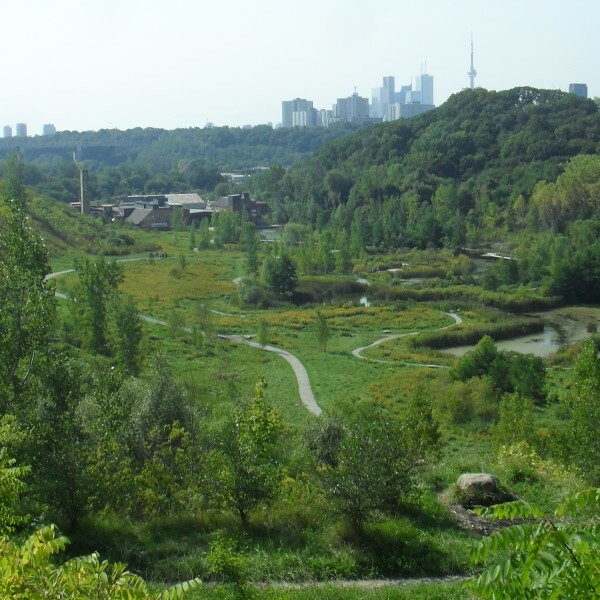 As the Don Valley Trail is home to many of Toronto’s ravines and watersheds, it is important to note that about 2.5 million of Toronto’s trees are found in ravines, which is about 25% of the city’s total, or just over 60% of all trees on public land. The Don Valley represents a large proportion of Toronto’s 27,000 acres of ravine, and as such, it is vital to the natural environment and culture of the city. The four main themes of the project are identified as ecology, water, community and movement. The Discover the Don project illustrates the ecological importance of the tree canopy surrounding the Don River, the significance of Don Valley Watershed as Toronto’s most prominent watershed, the variety of users of the space who come from a wide range of demographics, and finally the connectivity of the extensive trail system throughout the Don Valley. The students visited, documented, designed and refined work pertaining to the Lower Don Valley and the Evergreen Brick Works. In collaboration with the Evergreen Brick Works, the students established the existing conditions of the site using information panels to illustrate the findings that were hung at the Brick Works. Subsequently, a precedents board was created which speaks to examples of other cities around the world and how they accomplish successful trails and public spaces. The use of these examples will help to inspire the community and illustrate the potential of the Lower Don Valley.